Name and shame the fraudulent bailiffs in the UK's County Court system! 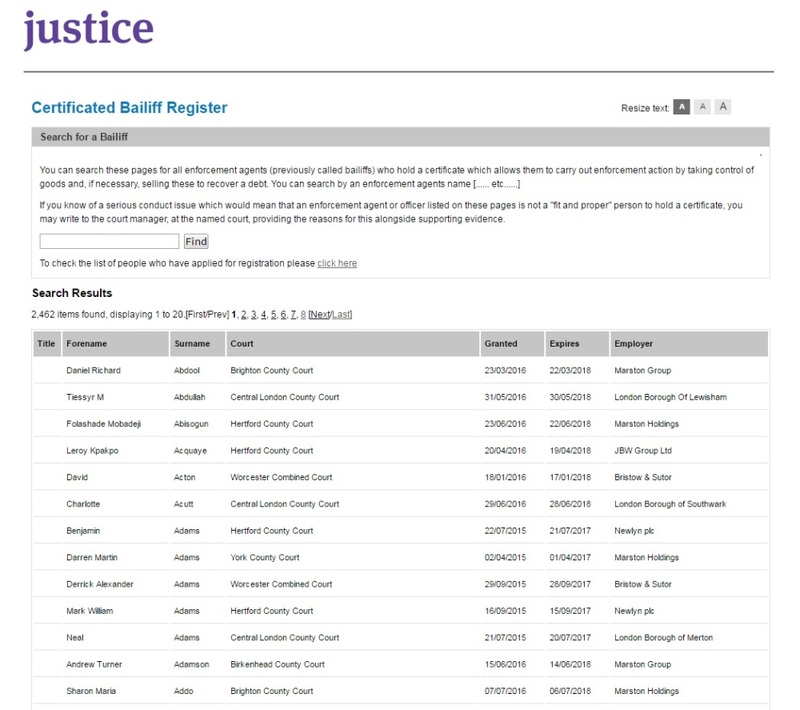 A dedicated page to all the fraudulent, non-registered bailiffs operating in the UK County Courts. This is going to be a progressive, up-to-date list of any persons claiming to be registered as official County Court appointed bailiffs. We will be listing each individual as we find them so you can steer well clear. ​ You can use the website above to search for any bailiff you might encounter and fear. If you find any that are not registered and listed, please get in touch with us and we will update our list and by doing so, you will be helping everyone else. At present (29/03/2017) there are no current enforcement bailiffs licensed and registered at the County Court at Manchester, 1 Bridge street West, Manchester, M60 9DJ.